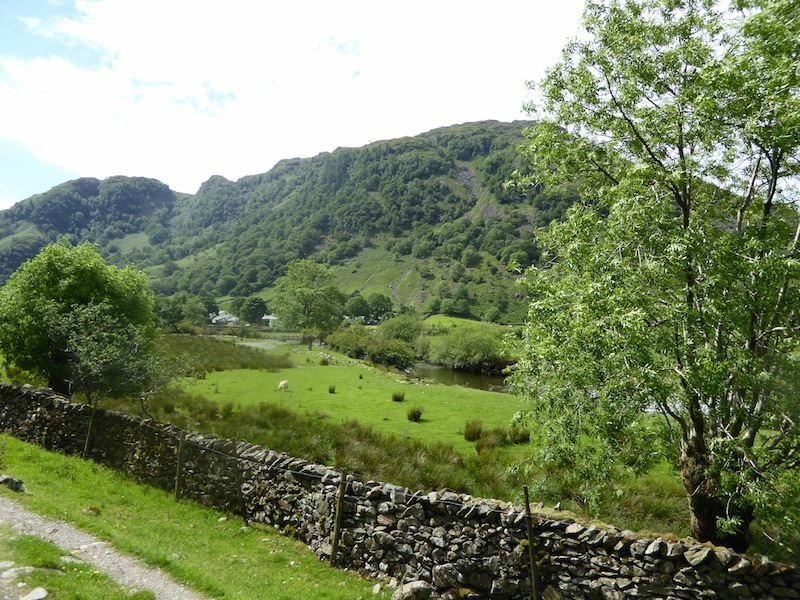 We had a low level and relatively flat walk today, chosen with the hot and humid weather in mind, and started out from Rosthwaite for a ramble around Borrowdale. 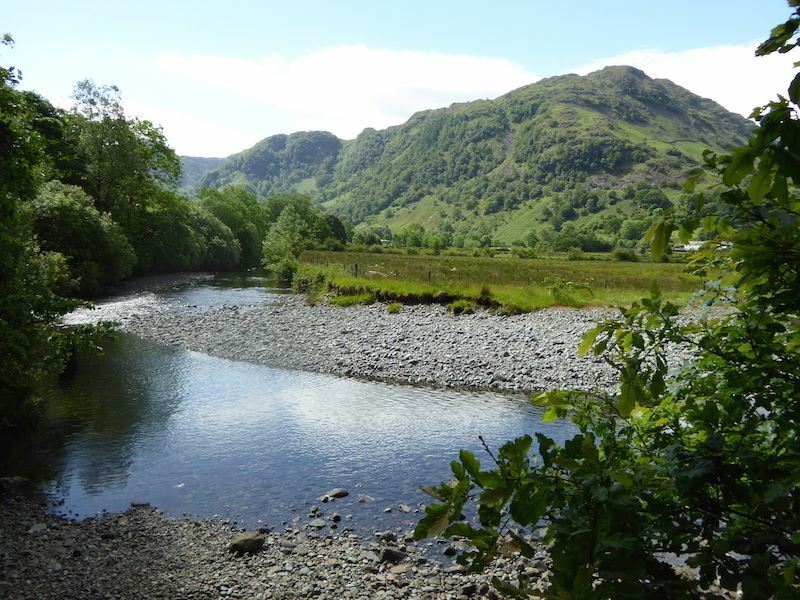 A view looking across to High Scawdel from the bridge at Rosthwaite, although the village itself is on the other side of the bridge and across the road from here. 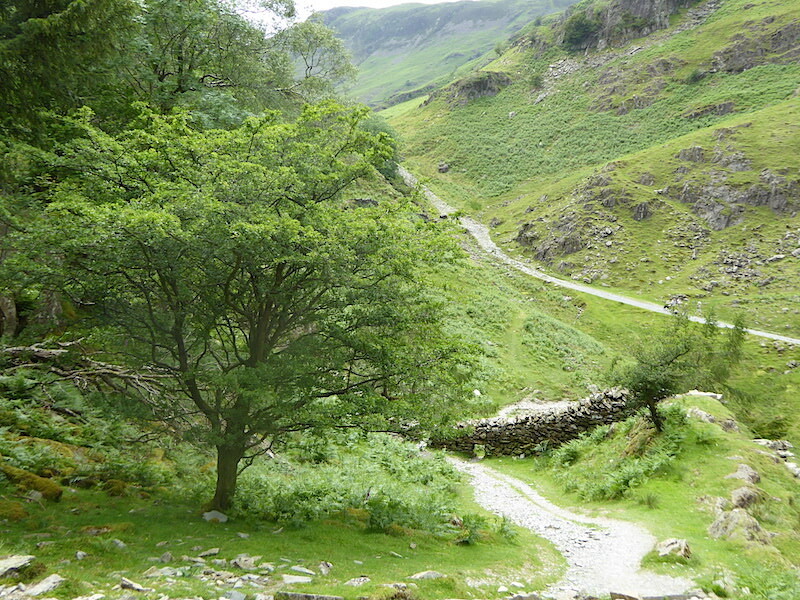 Looking back along the pleasant woodland path beside Stonethwaite Beck. 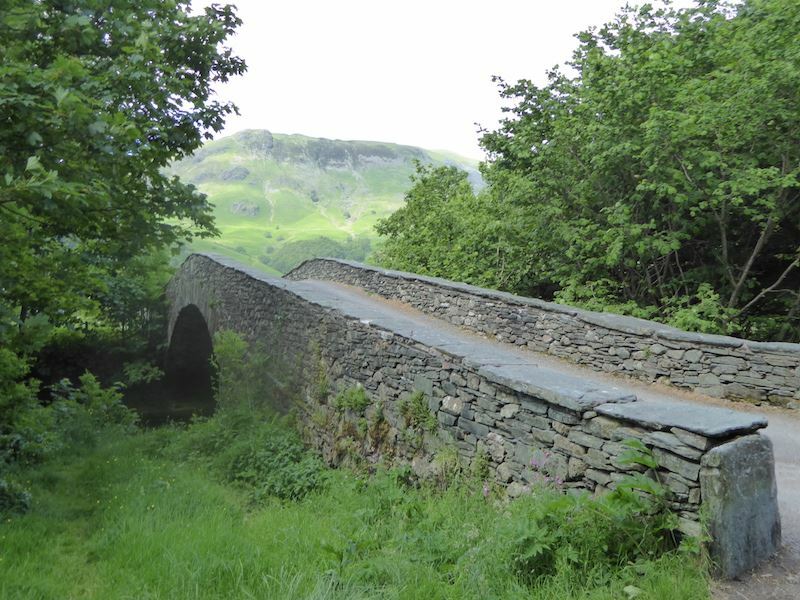 The bridge in the previous picture is at the far end of the path. 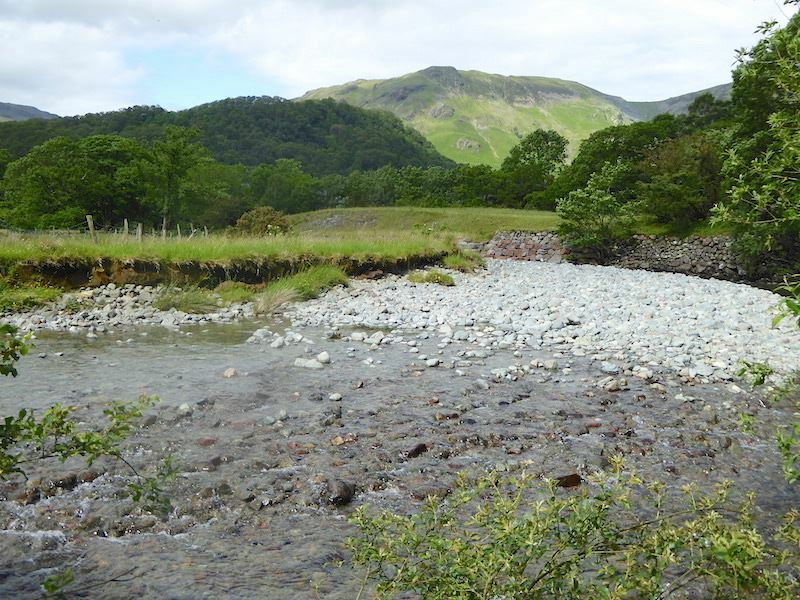 Looking towards Rosthwaite Fell across Stonethwaite Beck. 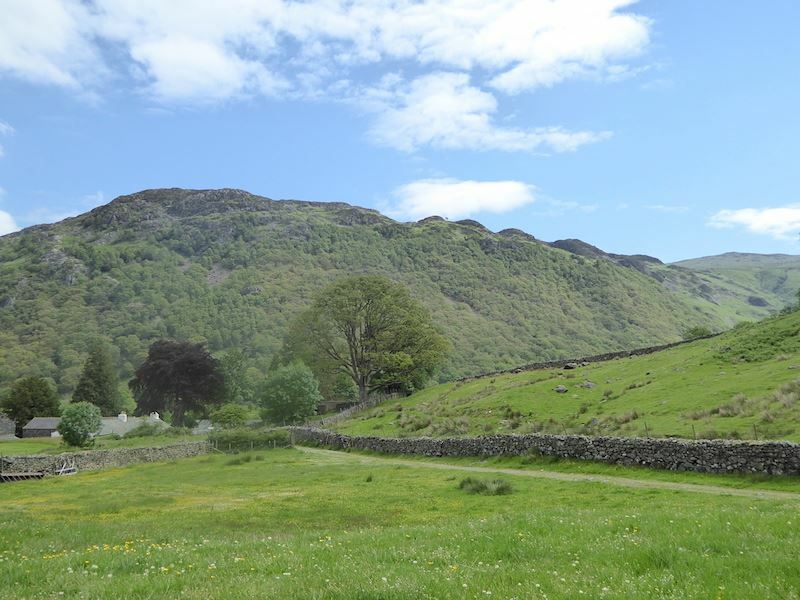 Looking across to High Doat (covered in trees) and High Scawdel (covered in sunshine) from the beck side. 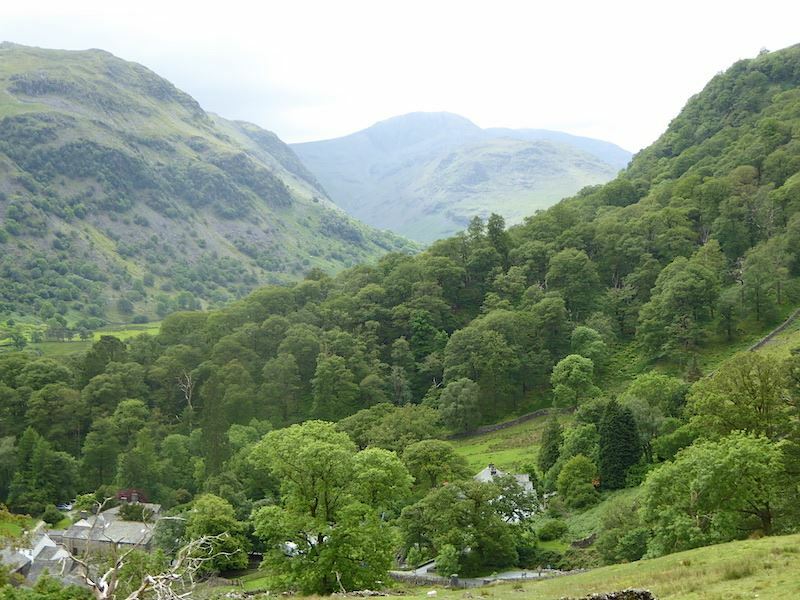 Stonethwaite village nestling below the slopes of Rosthwaite Fell. 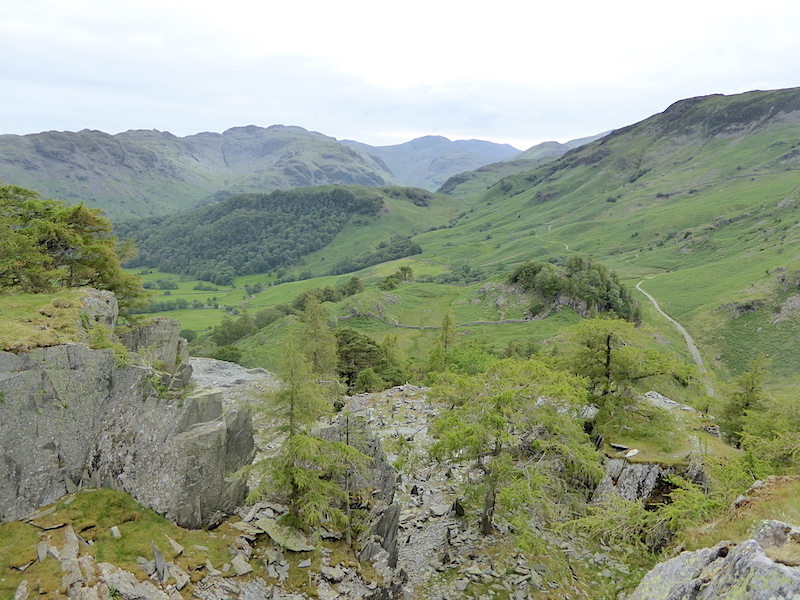 Looking along the valley with Eagle Crag in the middle of it. 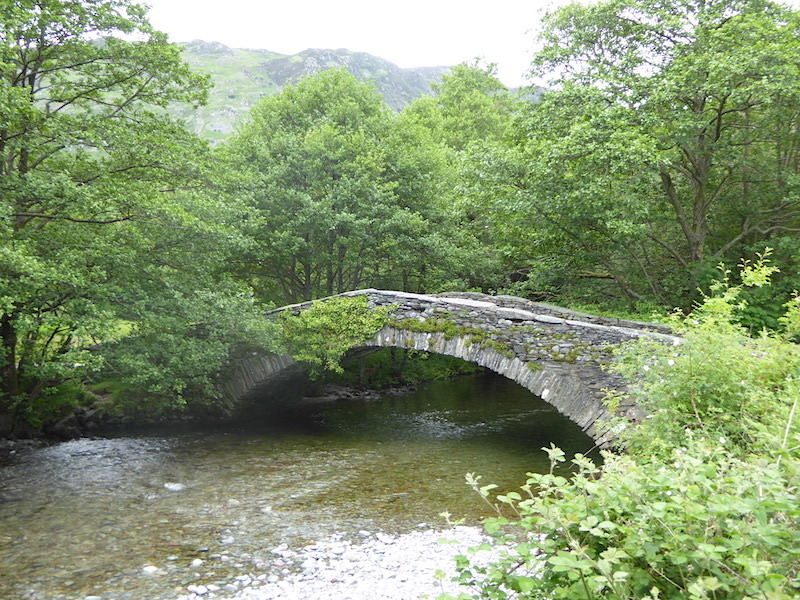 As we approached the bridge we witnessed the following …..
We crossed over into Stonethwaite after all the amusement and continued on our way. 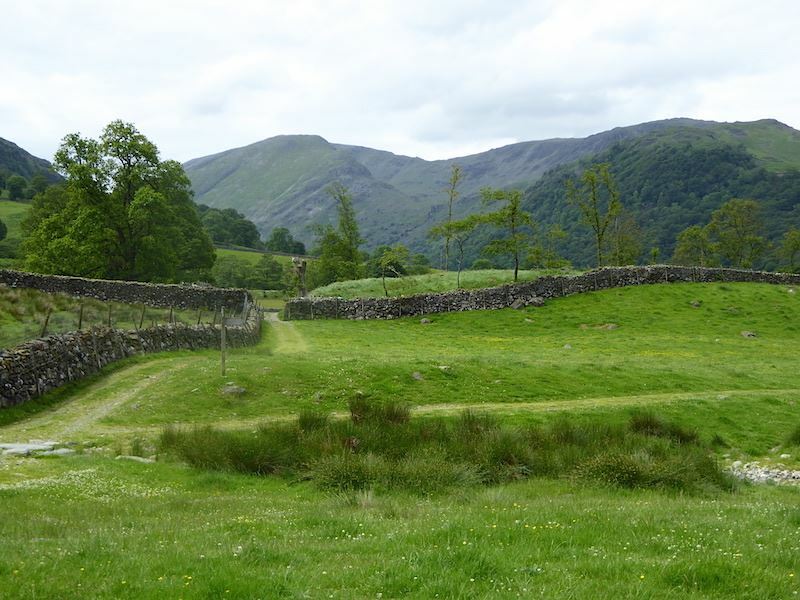 Greenup Edge and Eagle Crag are on our left as we walk along the lane into Stonethwaite. 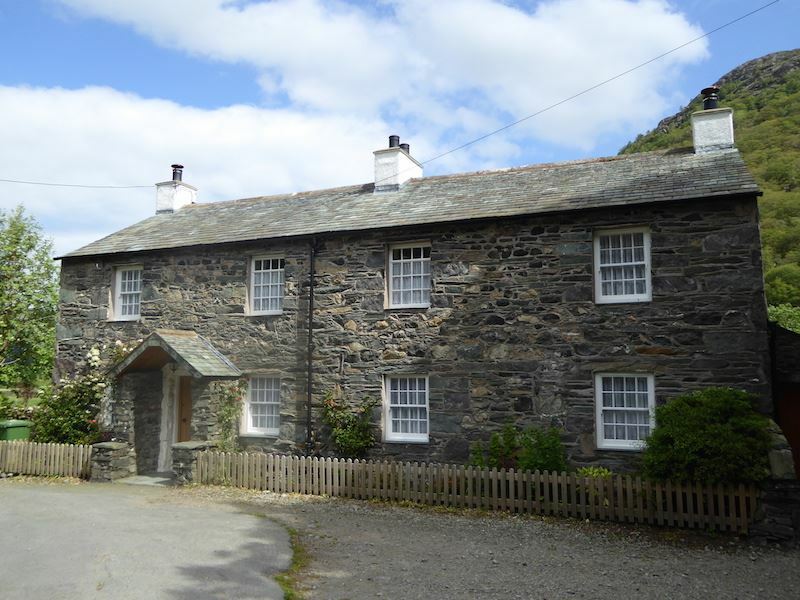 Passing by one of the cottages in Stonethwaite village. 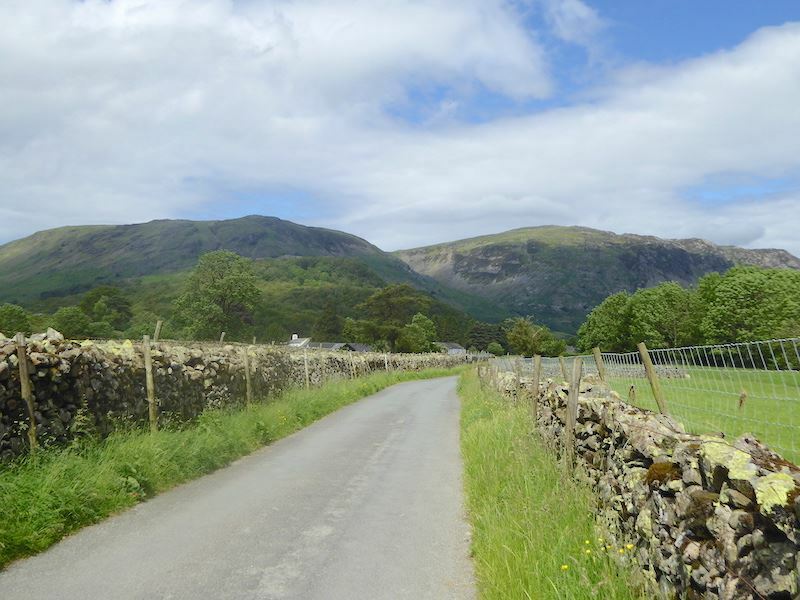 The lane leading out of Stonethwaite. Around the corner from the church we get a view of Base Brown, that’s the one to the left. 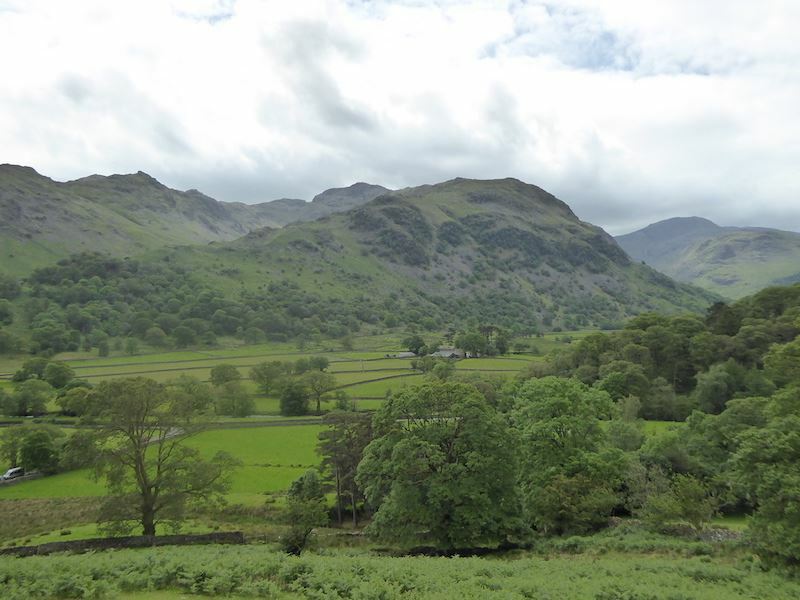 To the right of it are Brandreth and Grey Knotts. 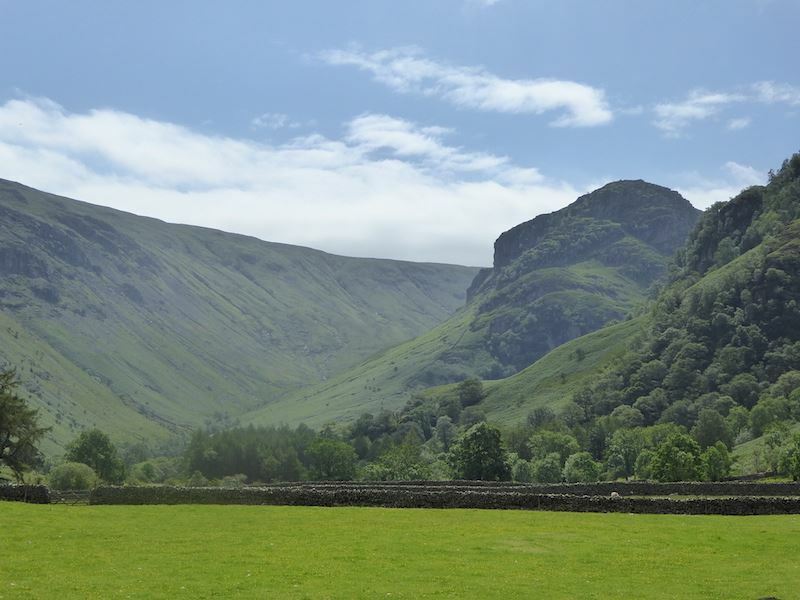 The bowl shaped area between them is the hanging valley of Gillercomb. 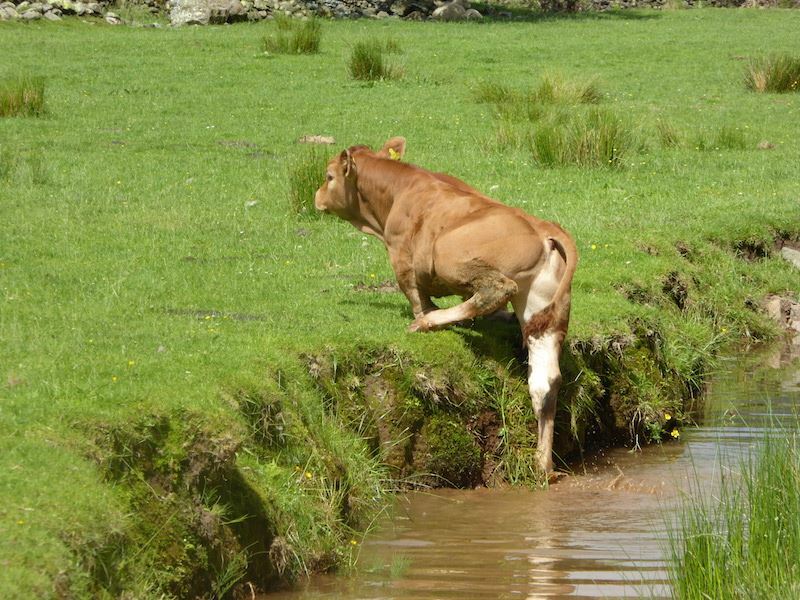 We’ve taken a right turn off the path by the wall there and are crossing the field to join the road. 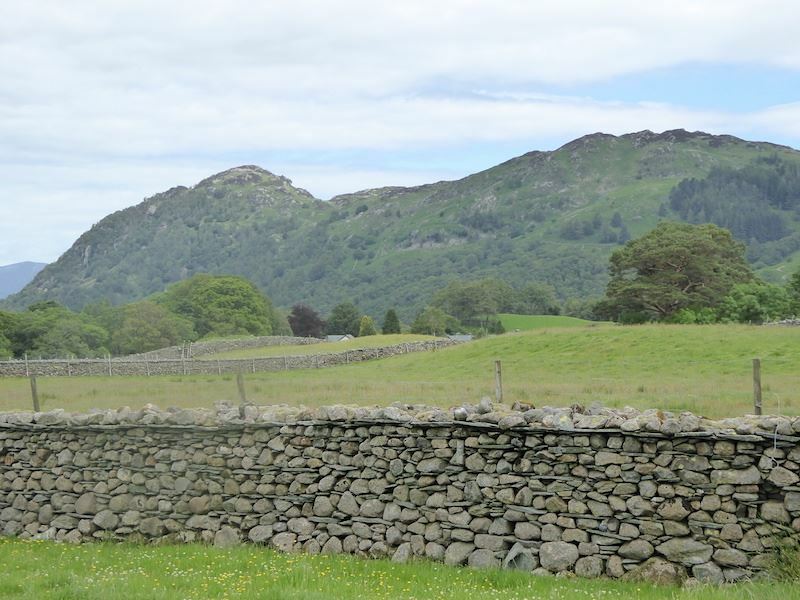 Over there is Rosthwaite Fell. 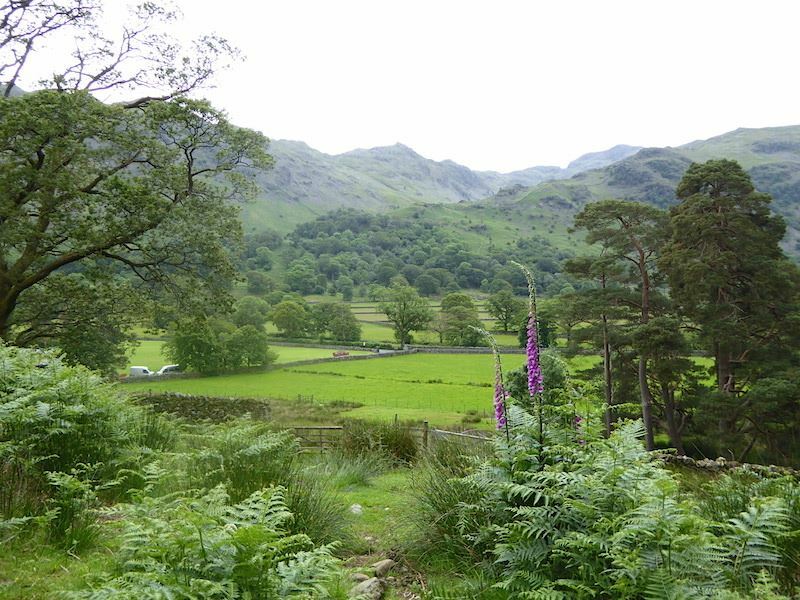 Still crossing the field but now looking across to Grange Fell. 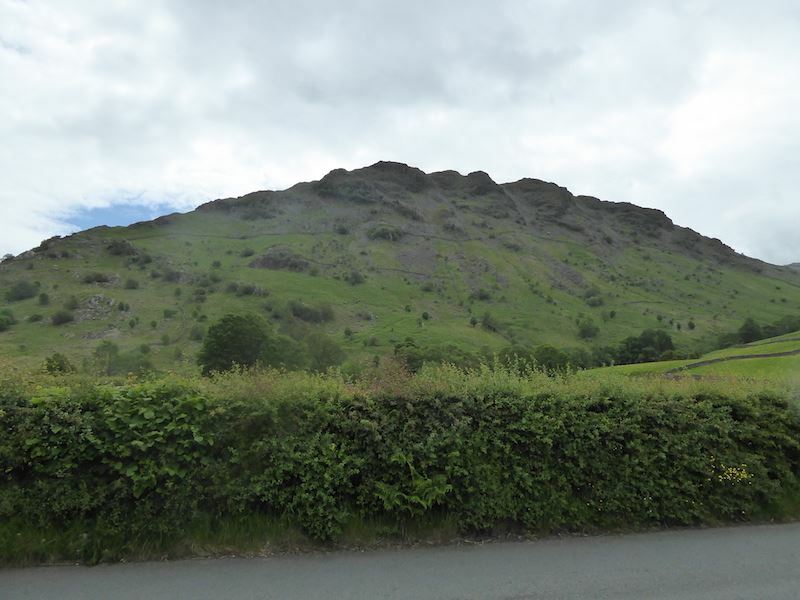 Its two high points are, Kings How on the left and Brund Fell on the right. 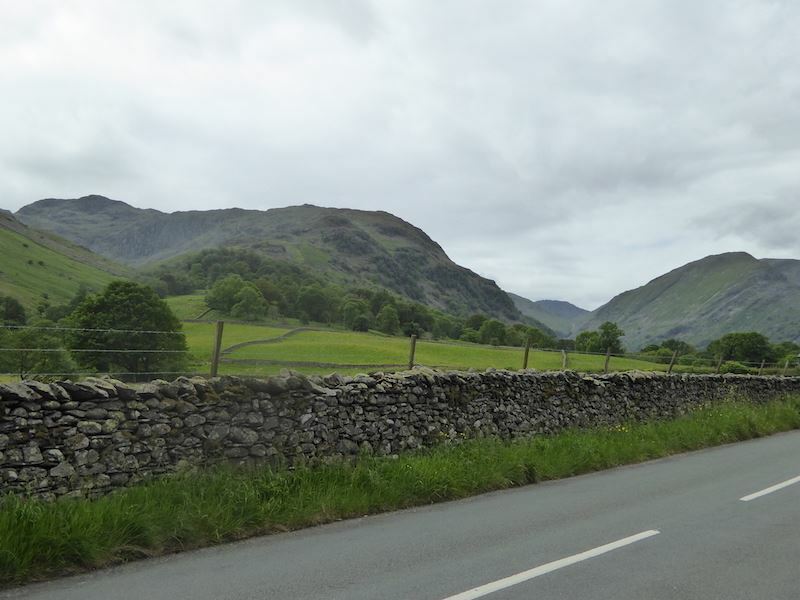 A bit of road walking along to Seatoller, with Thornythwaite Fell to the left and Combe Head above it on the extreme left. Base Brown is over on the right. 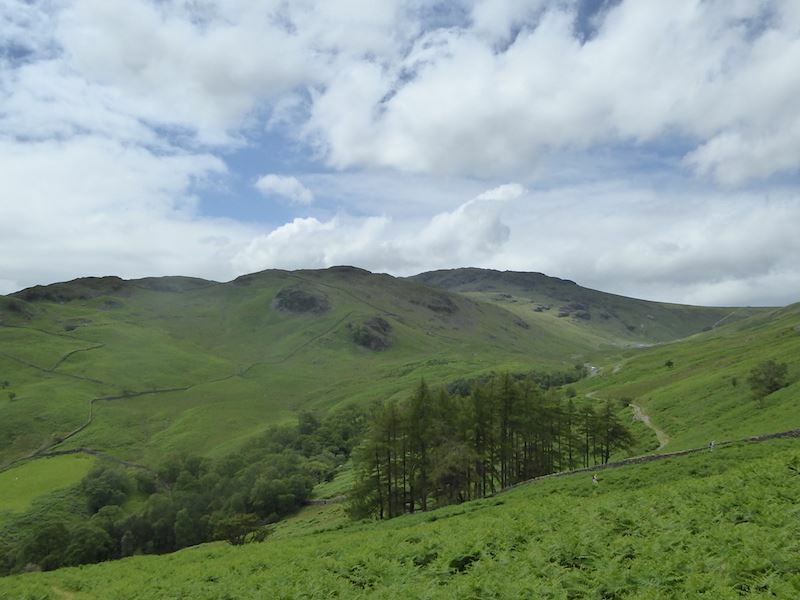 From the Seatoller road looking across to Rosthwaite Fell. 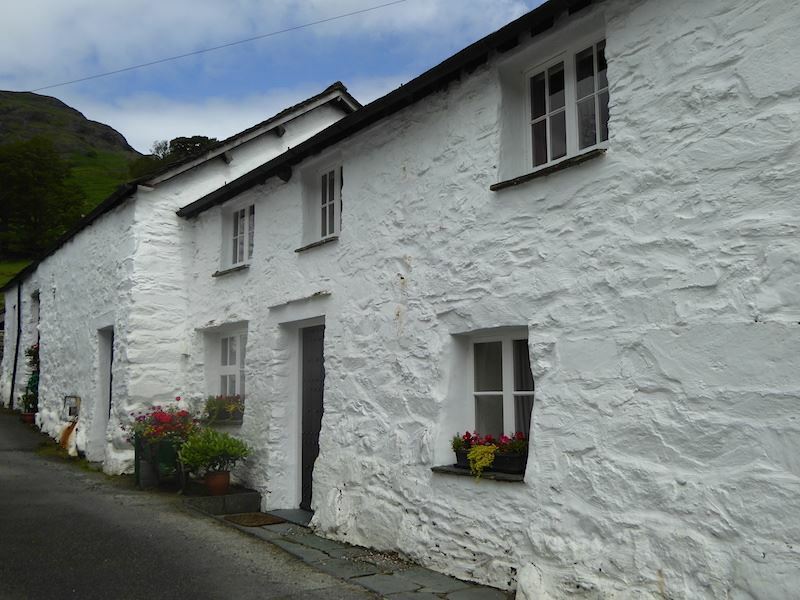 Sunshine, whitewahed cottages and lots of flowers in Seatoller. 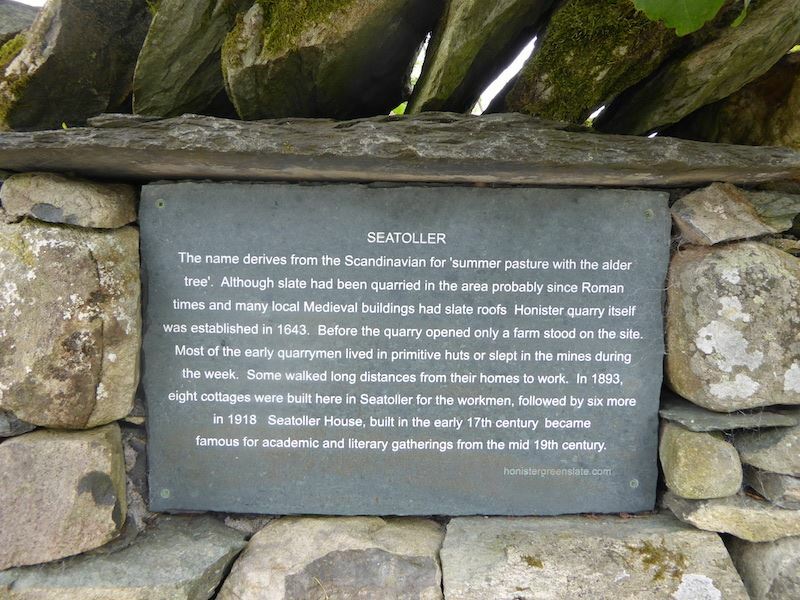 A potted history of Seatoller set in the wall by the bus turning point. Looking back at the view as we take the path out of Seatoller. 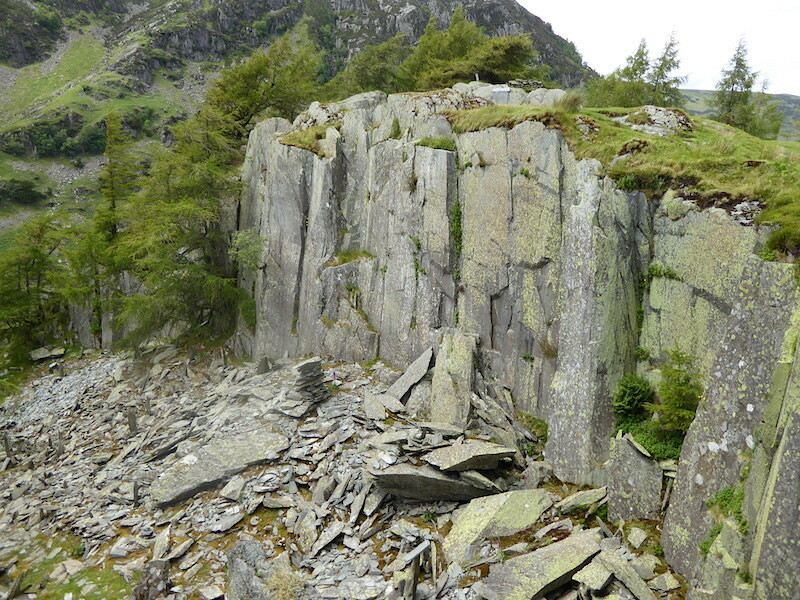 A close up of Great End rising beyond Seatoller Fell. It was now very warm and muggy beneath those clouds. 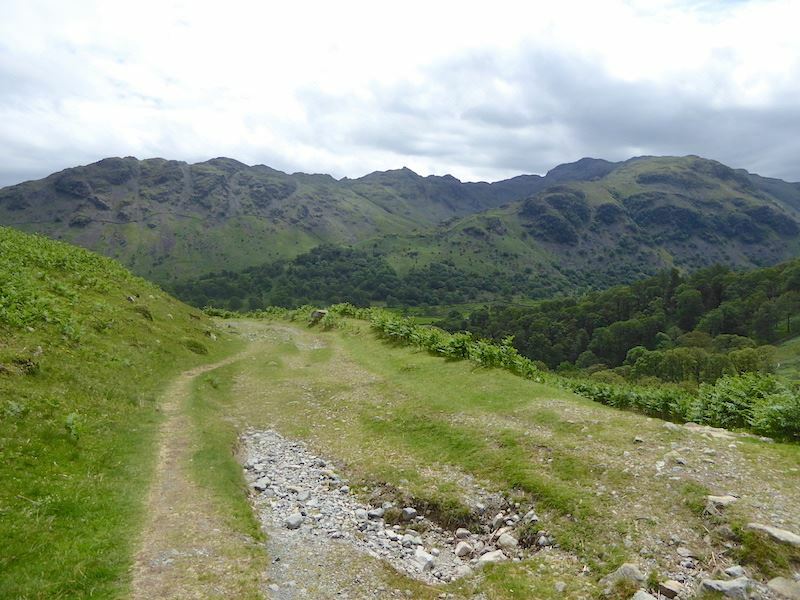 We’re now on the path below HIgh Doat and on the skyline on the left are the peaks of Low Saddle and High Saddle with Ullscarf further along. 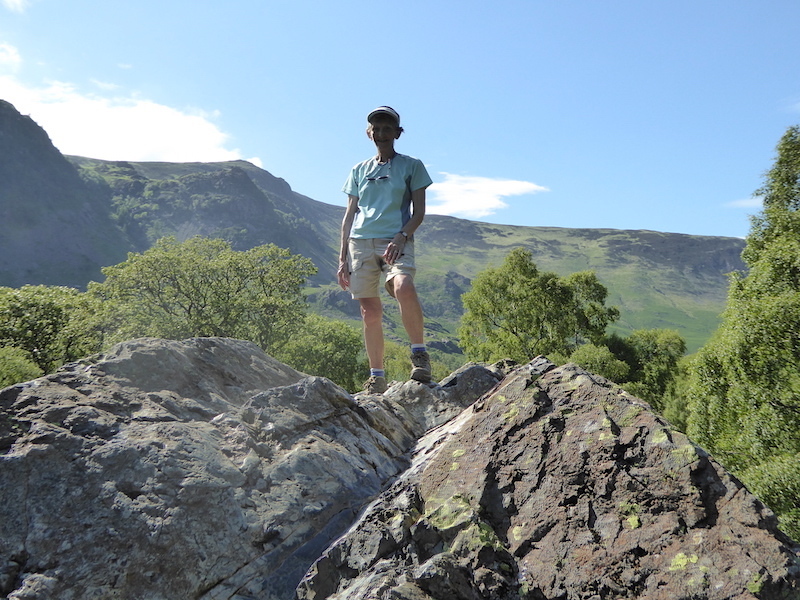 In the centre is Thornythwaite Fell with the rocky outline of Combe Head just behind it. 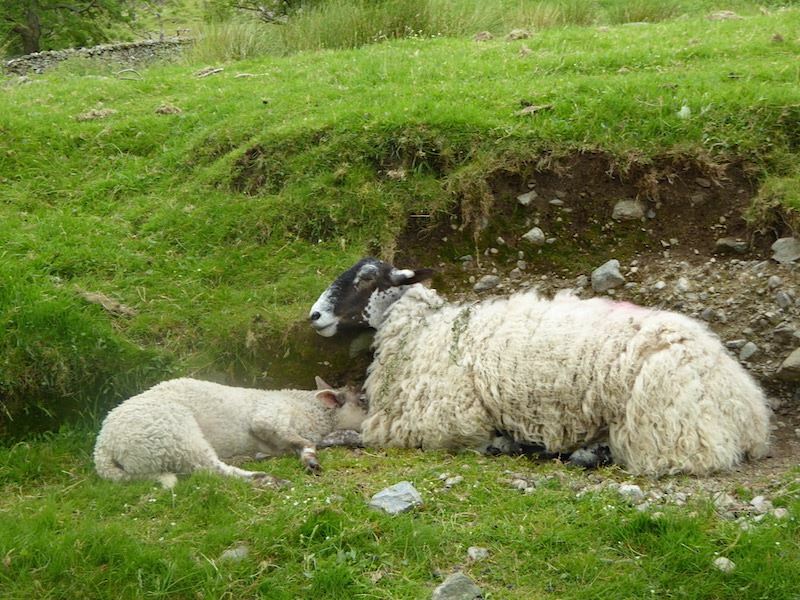 These two were panting furiously to try and cool down, and they weren’t the only ones feeling the heat. Humidity was high today with only the occasional breeze. Very hazy now over Great End and very warm walking up here too. 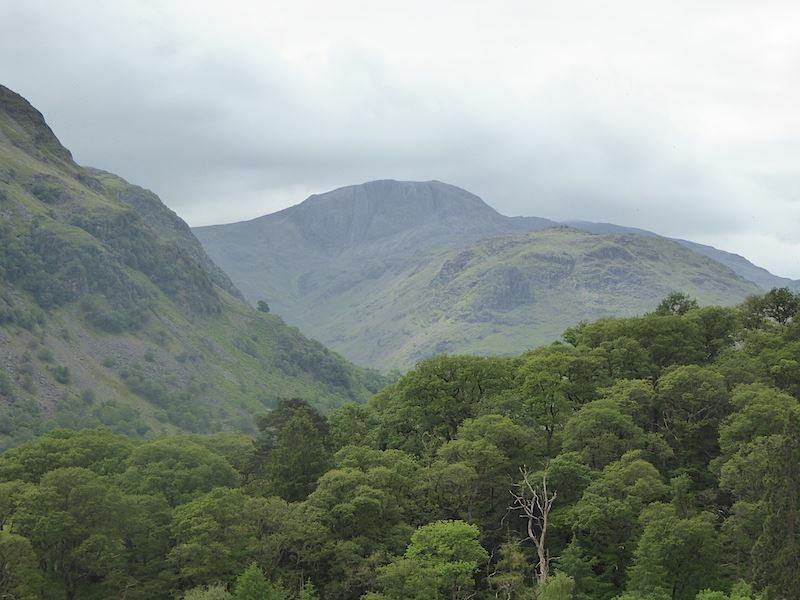 Hints of blue sky appearing over Seatoller Fell. 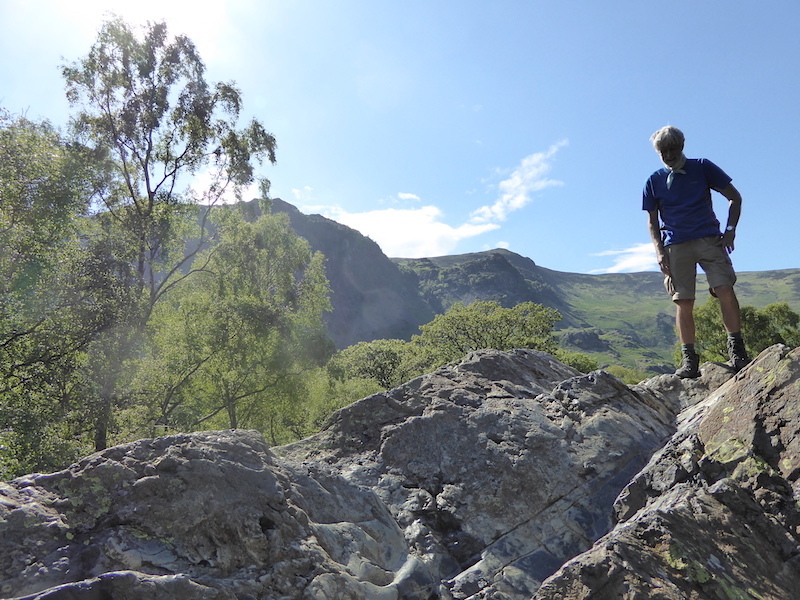 Looking back at the path we have been following, not at all steep but there was still lots of brow mopping thanks to the energy sapping humidity. 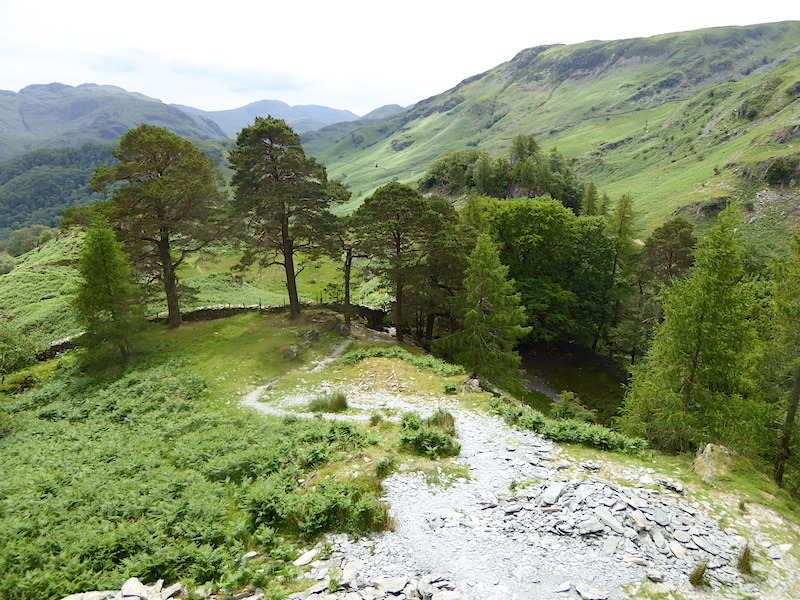 Alongside the trees are the road and path to Honister. 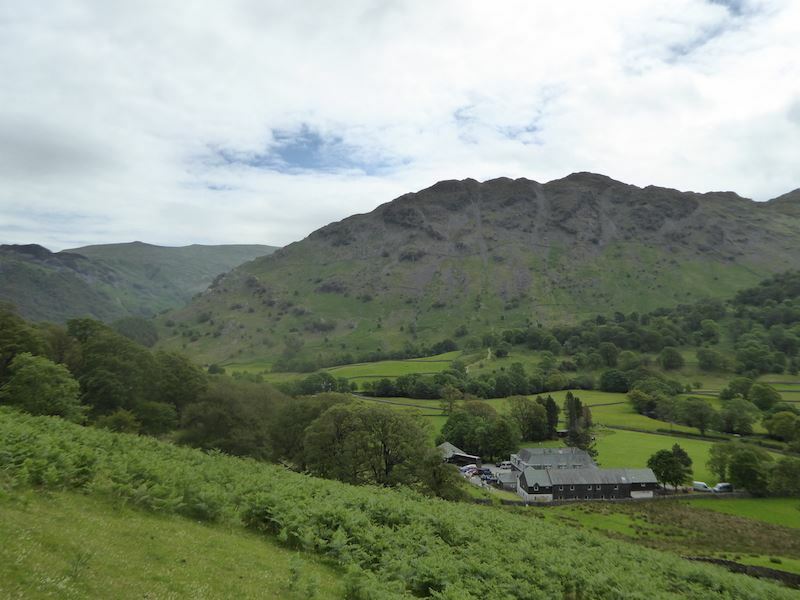 The mine buildings are just visible at the bottom of the sunny patch on Grey Knotts. 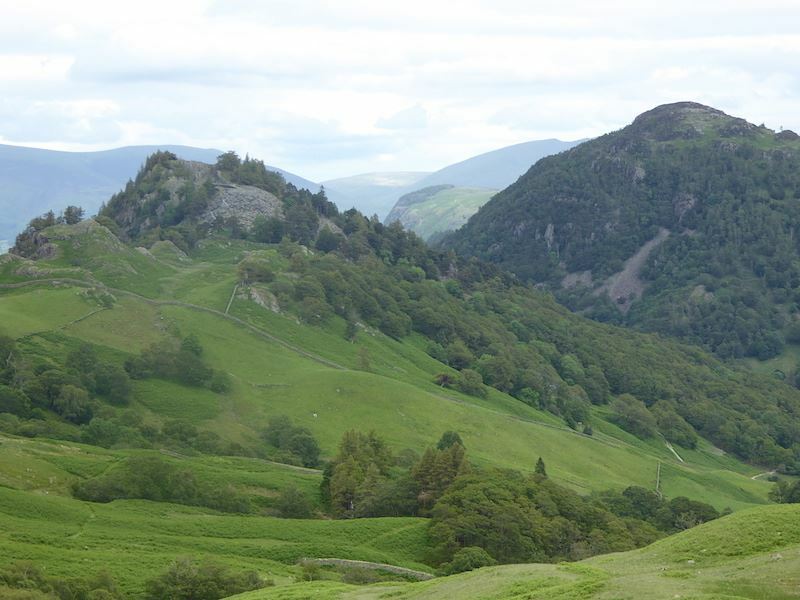 We take a break on the slopes of High Doat and enjoy the view down to Castle Crag with Grange Fell to the right of it. 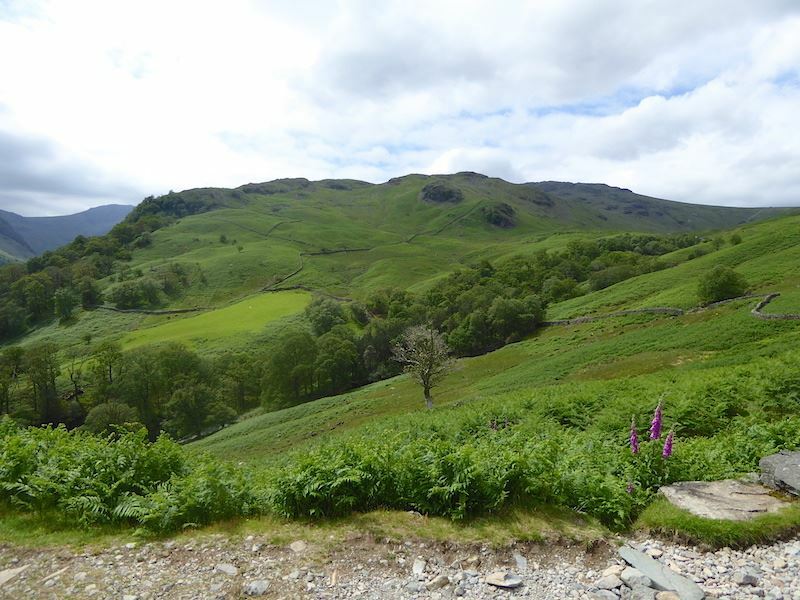 Its a nice view so I took a close up of it …..
Also from our perch on High Doat, a view over to our right of Brund Fell with High Seat in the distance …..
….. while to our left we have High Scawdel for company. 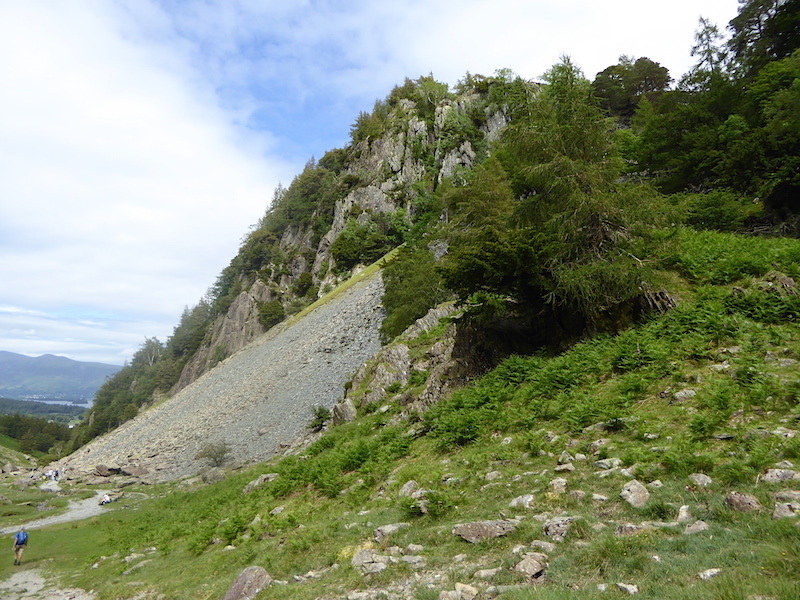 Between the slopes of Low Scawdel and Castle Crag is a glimpse of Derwentwater with Skiddaw in the background. 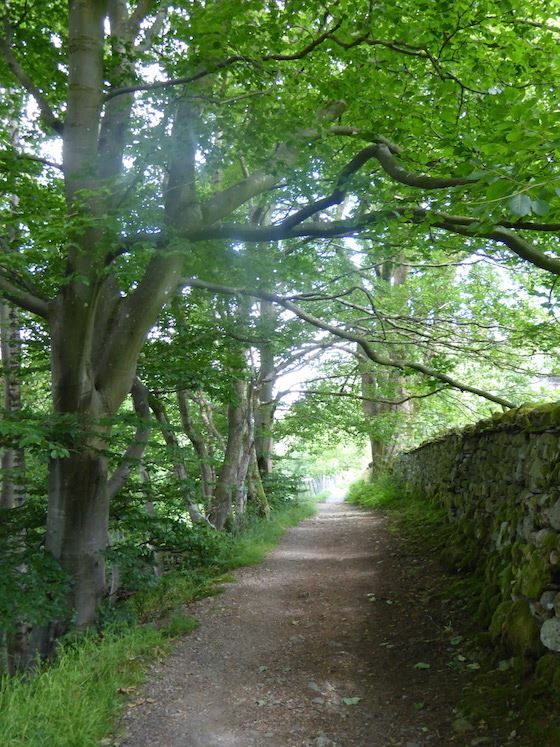 After our break we join the Allerdale Ramble path. 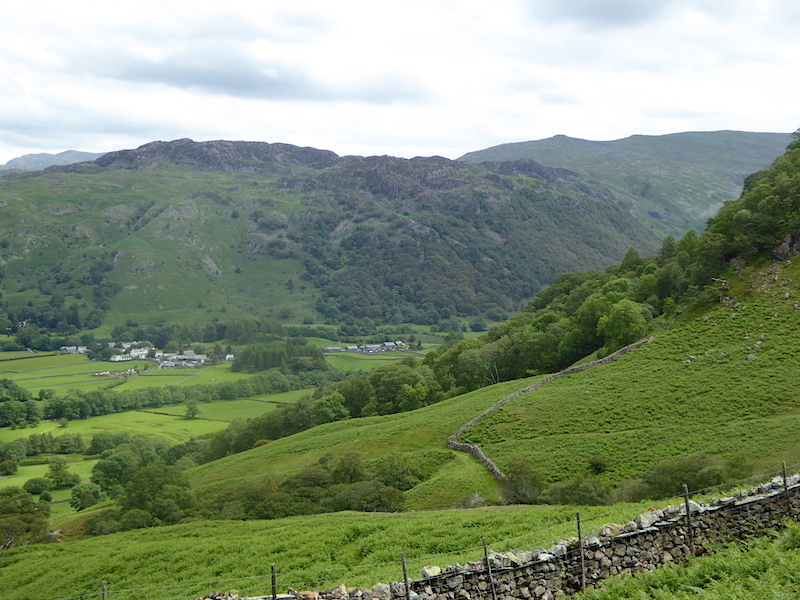 On our right there’s a glimpse of Rosthwaite below the slopes of Great Crag. 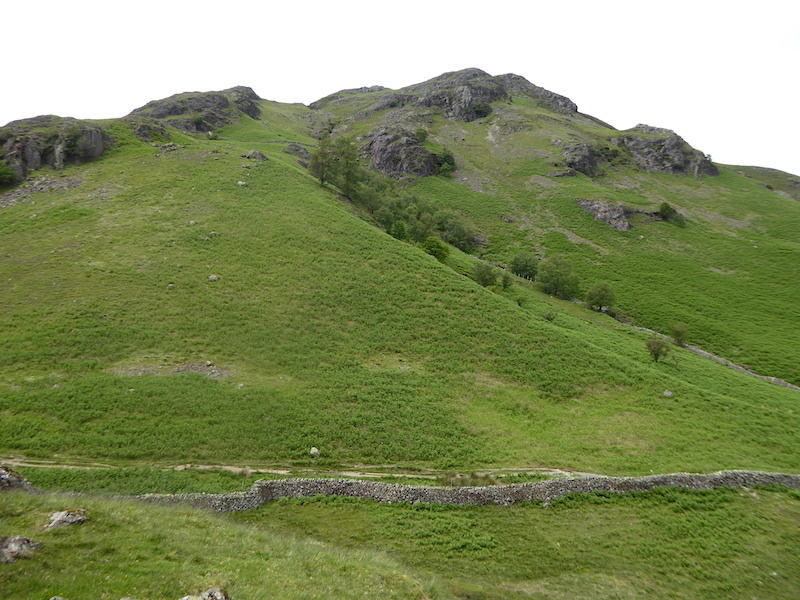 Low and High Saddle and Ullscarf are on the right skyline. 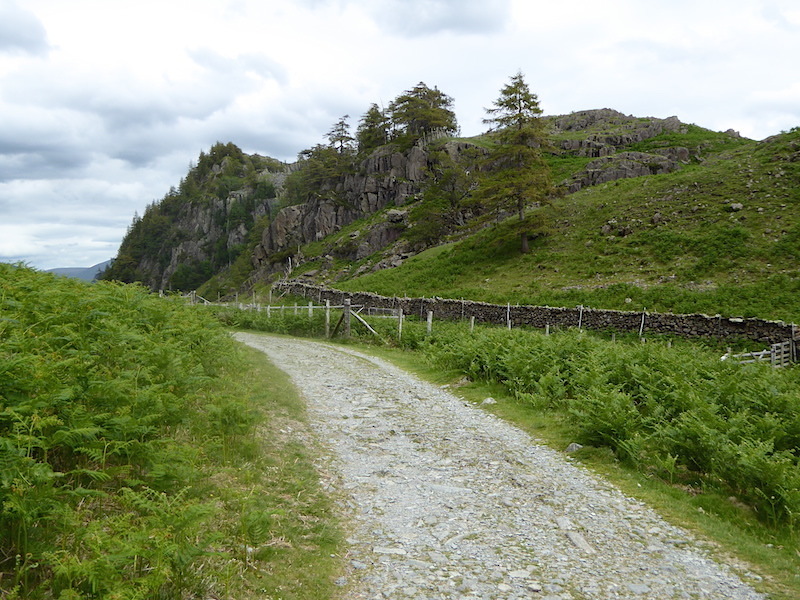 Approaching Castle Crag but can we get across to it? 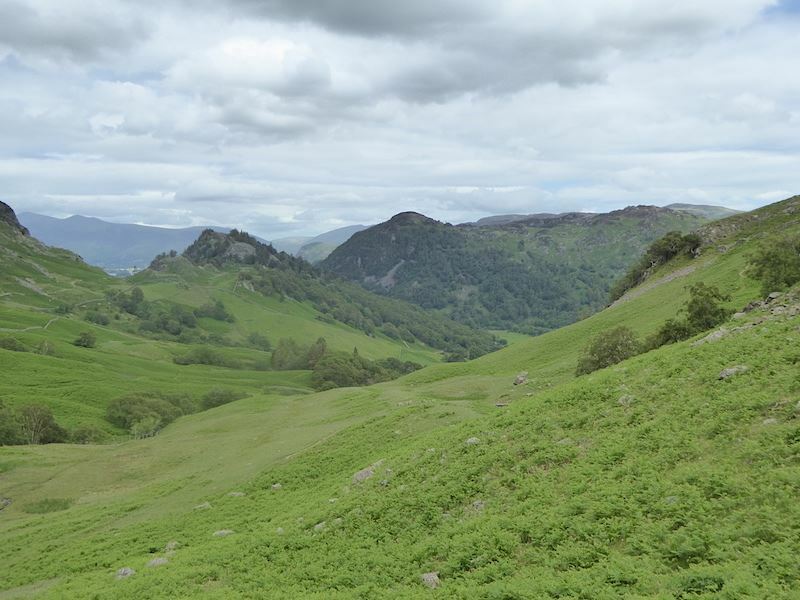 We find a gate in the wall and make our way across the moist ground to Castle Crag. 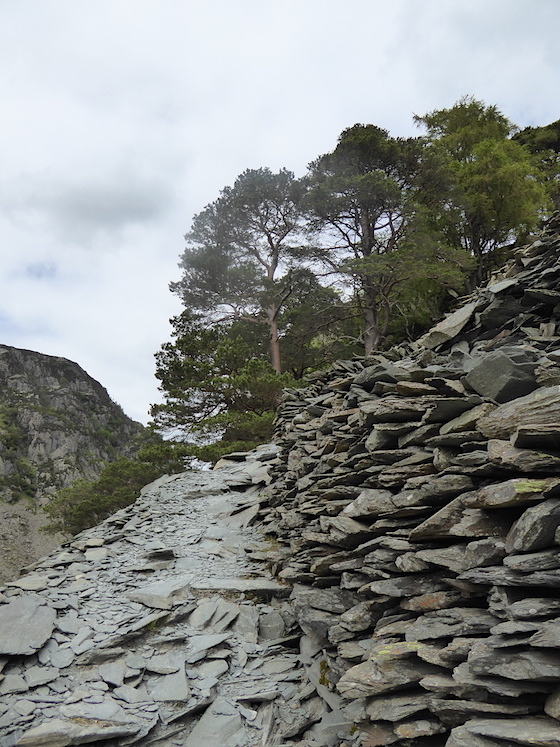 Approaching the zig zag path up the slate spoil heap on Castle Crag. 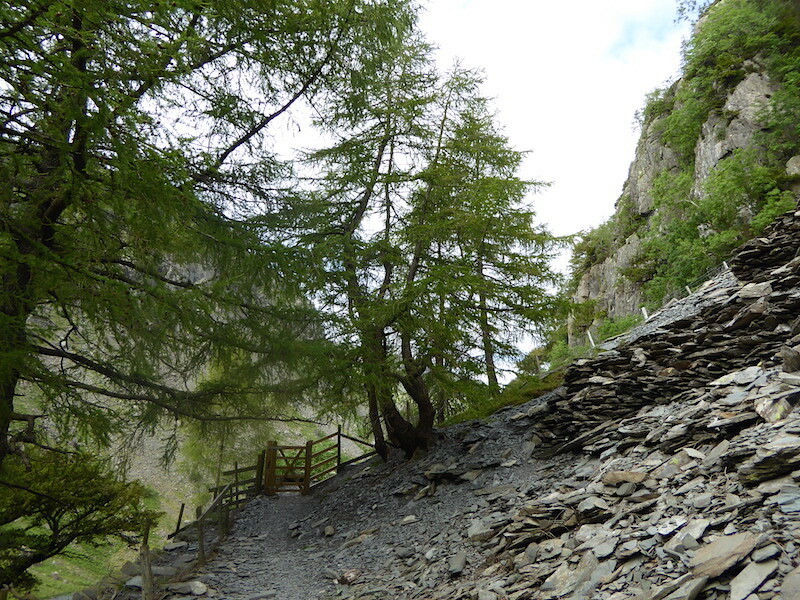 Looking up the loose slate path …..
….. and the view looking down. 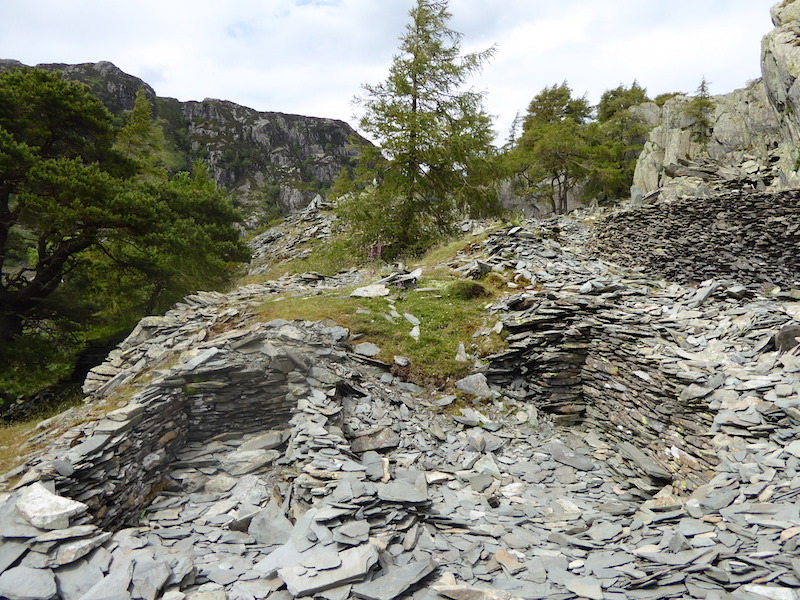 The old quarrying area at the top of the path. 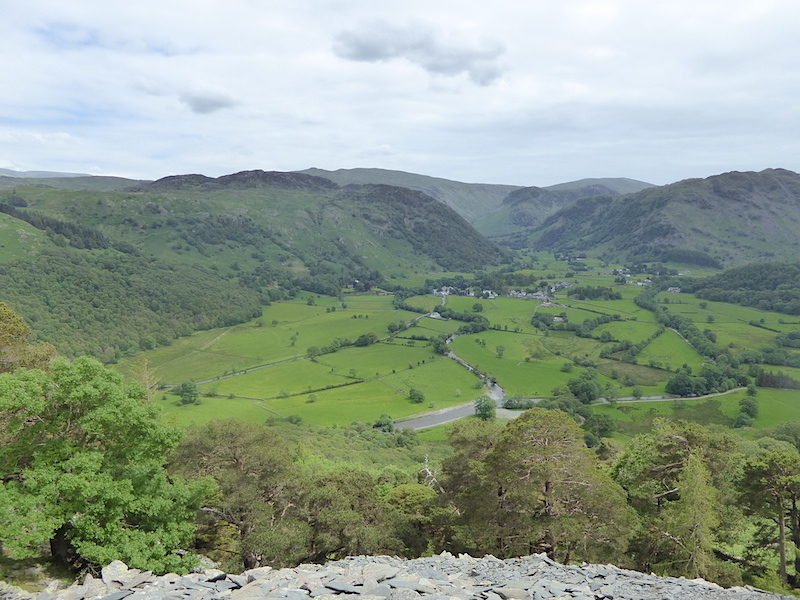 The view towards Rosthwaite from the Castle Crag quarry, and below some views of the quarry area ….. 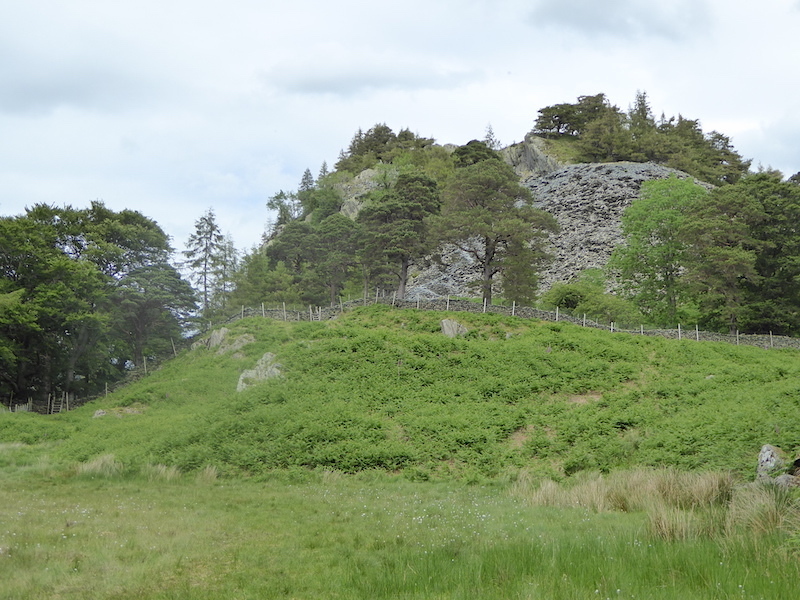 The summit area of Castle Crag. 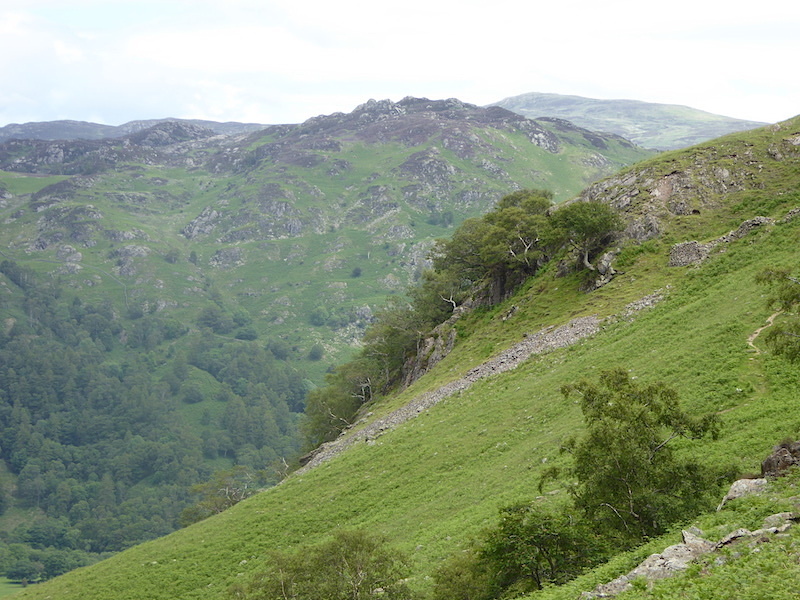 Over on the right is the path we followed to get here, and in the centre the tree covered slopes of High Doat where we had our break. 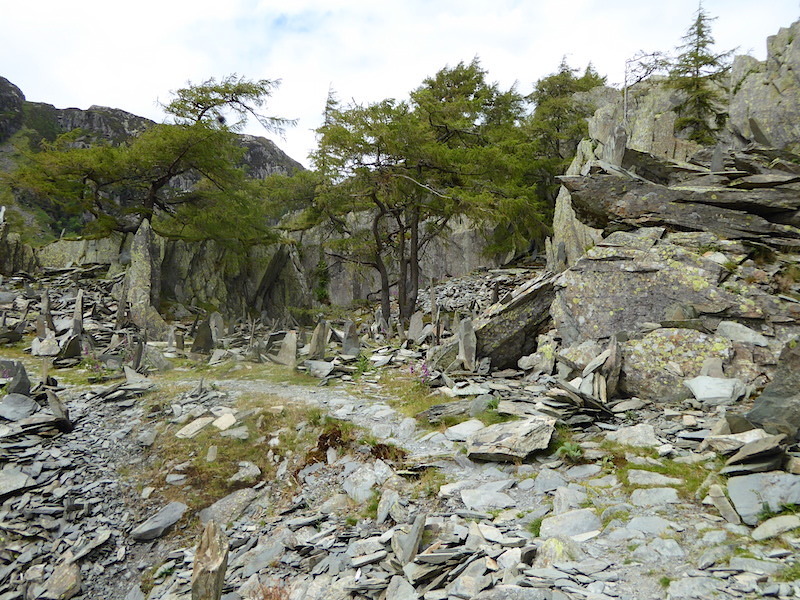 Another look down into the quarry from the summit. 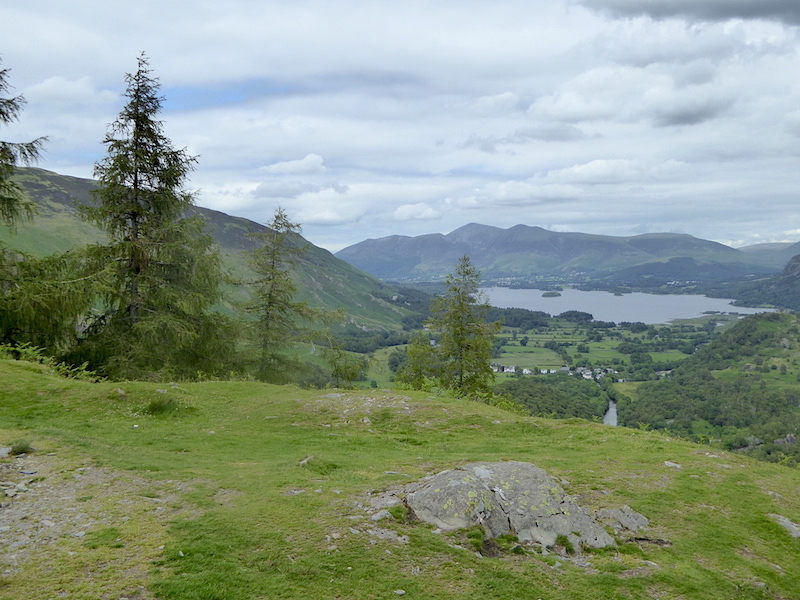 Derwentwater and the Skiddaw fells from Castle Crag summit. 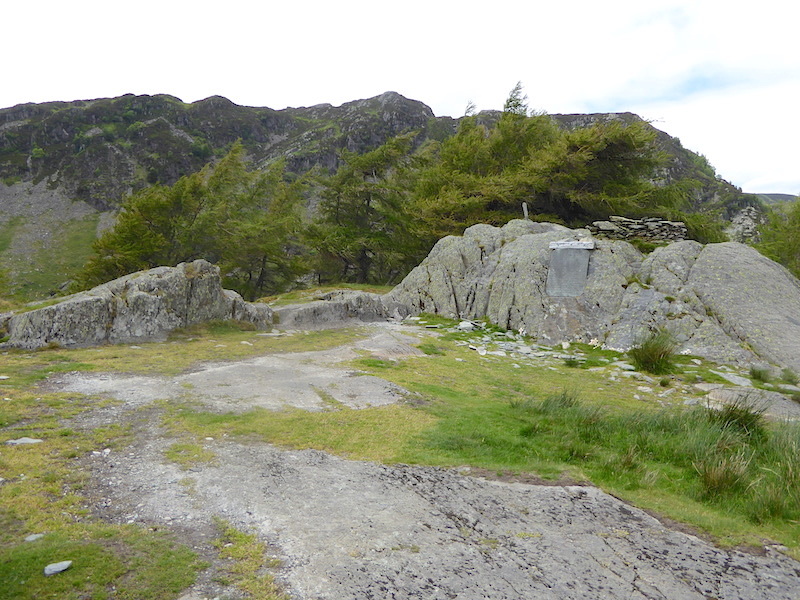 Castle Crag summit, with crosses from the 2014 Remembrance Day service still in place. 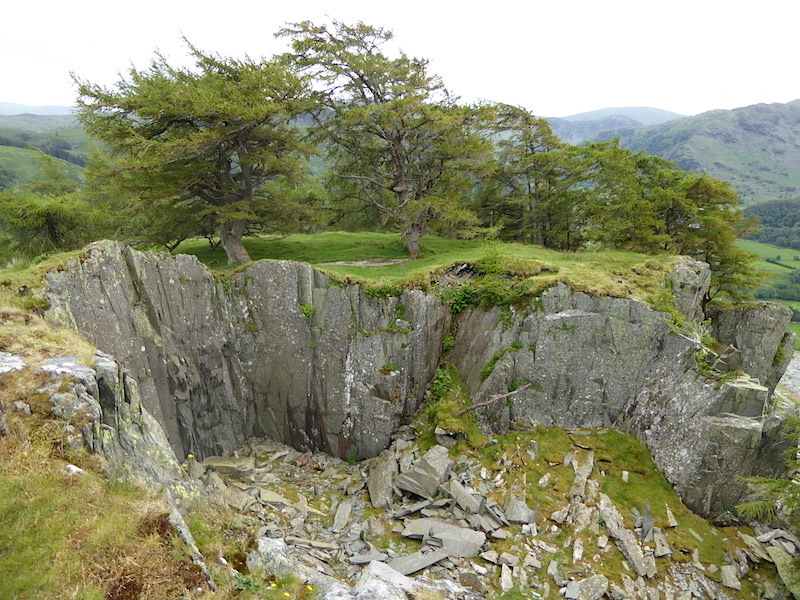 Kings How, part of Grange Fell, is the main feature here. 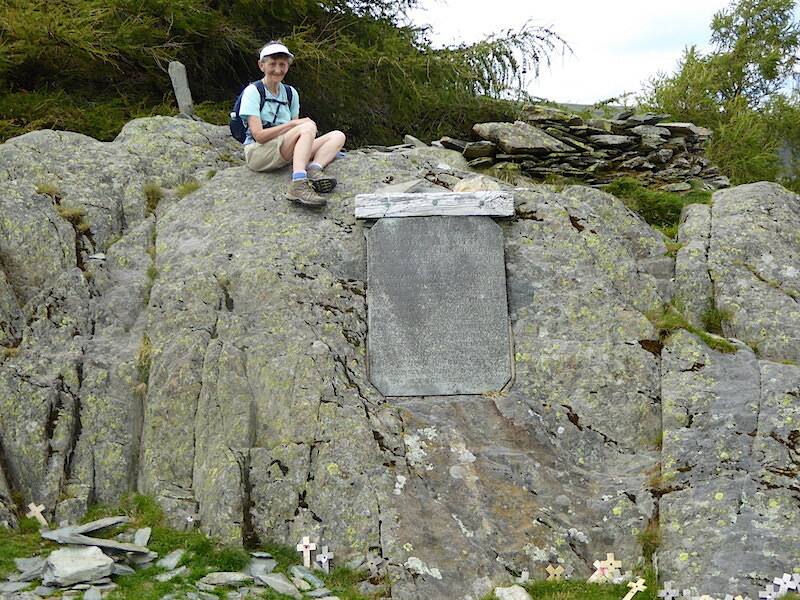 Grange Fell was dedicated to the memoery of King Edward VII, as a sanctuary of rest and peace, on his death in 1910, by his sister Princess Louise who was president of the National Trust at the time. 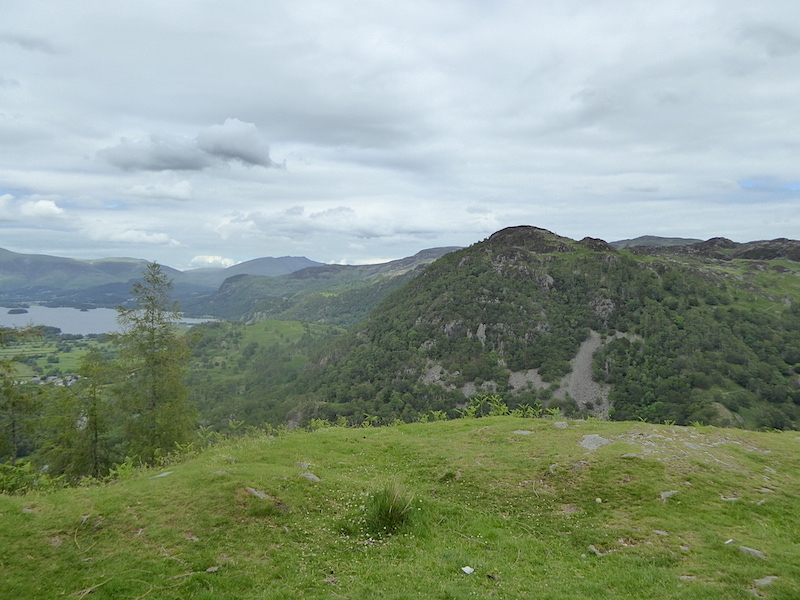 Derwentwater and the Skiddaw range behind it, with the slopes of Maiden Moor over to the left. 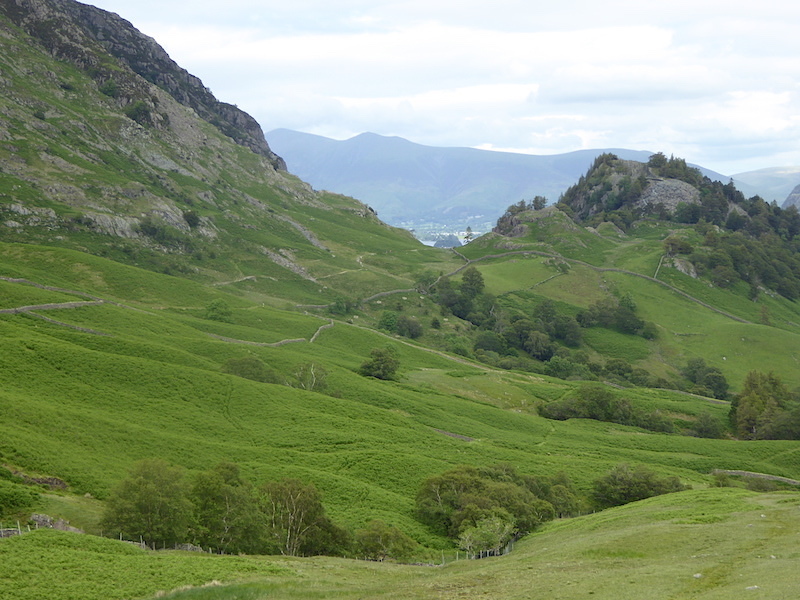 Making our way down from Castle Crag. 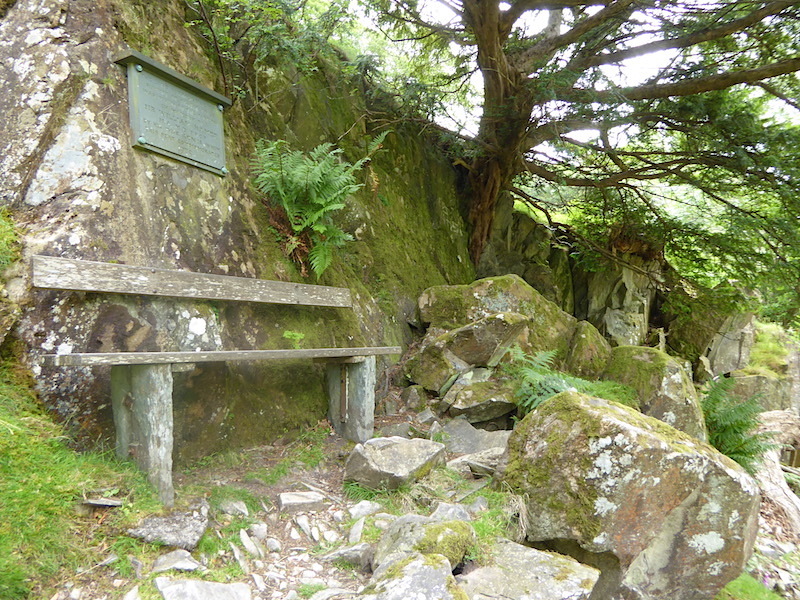 Over on our left we spot this seat and plaque. I don’t know who made the seat but their carpentry skills are on a par with mine. 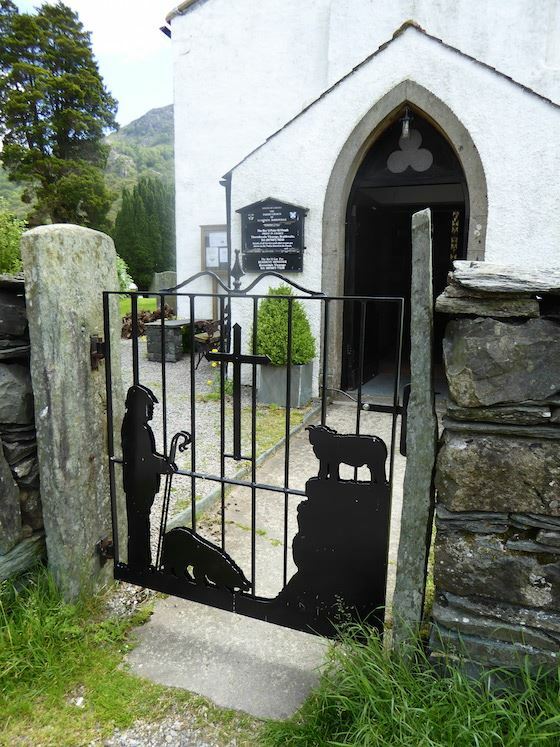 Two lumps of stone, two planks of wood and some fixings, I can do that, wonder if they are recruiting? 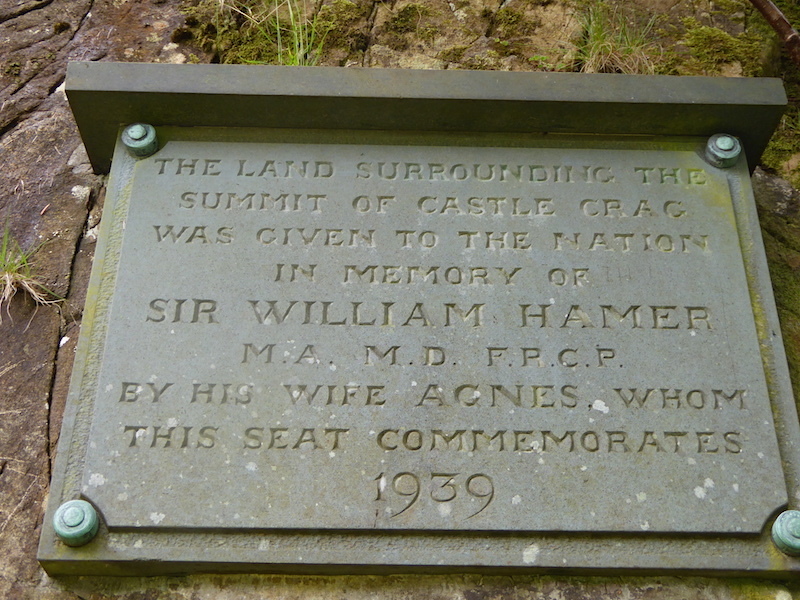 The information on the plaque. 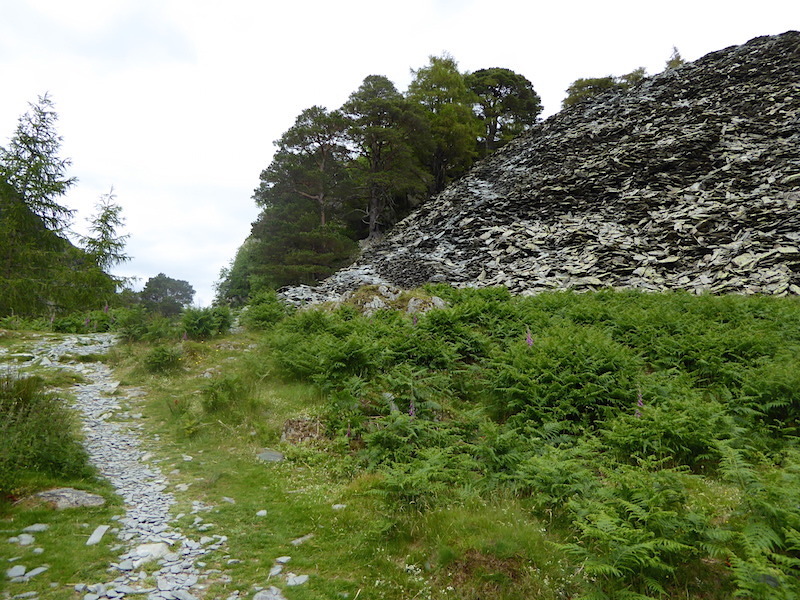 A look up at Castle Crag as we rejoin the main path. 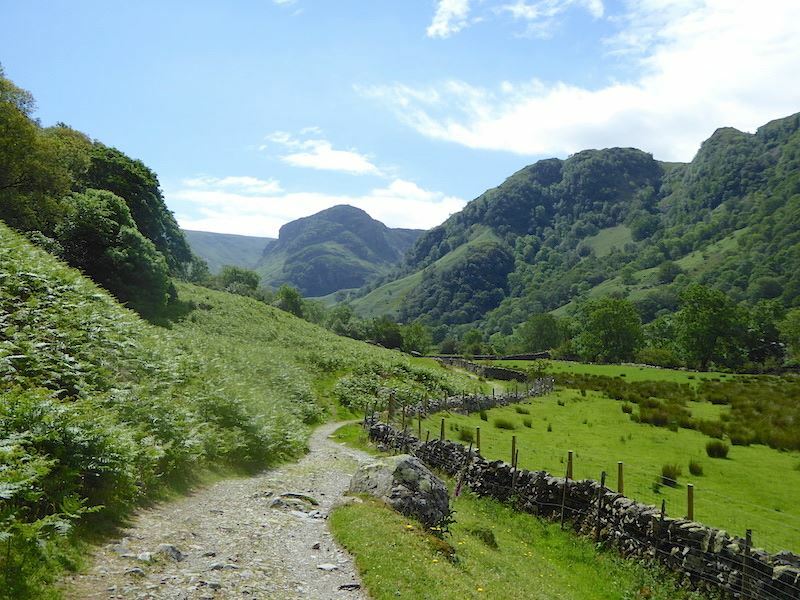 The path ends beside the River Derwent, turn left for Grange and right for Rosthwaite. 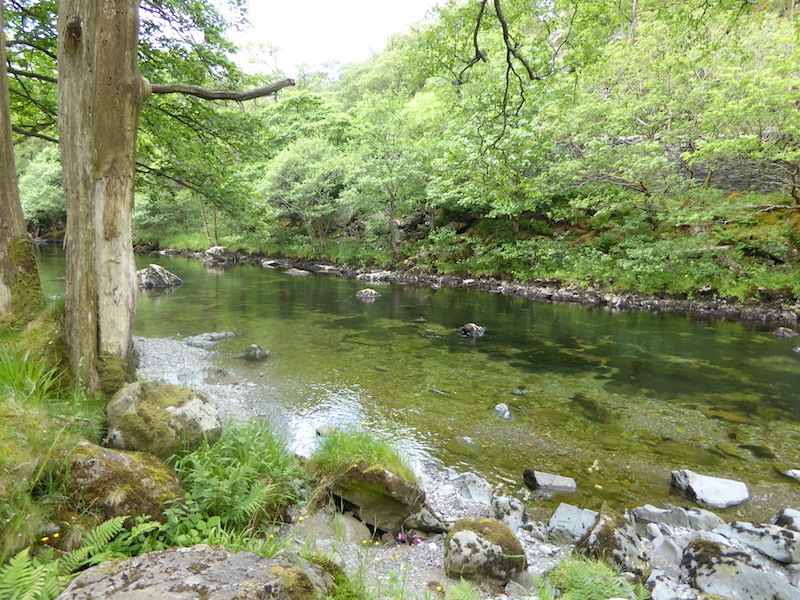 We turned right and headed back to Rosthwaite along the pleasant woodland path beside the River Derwent. 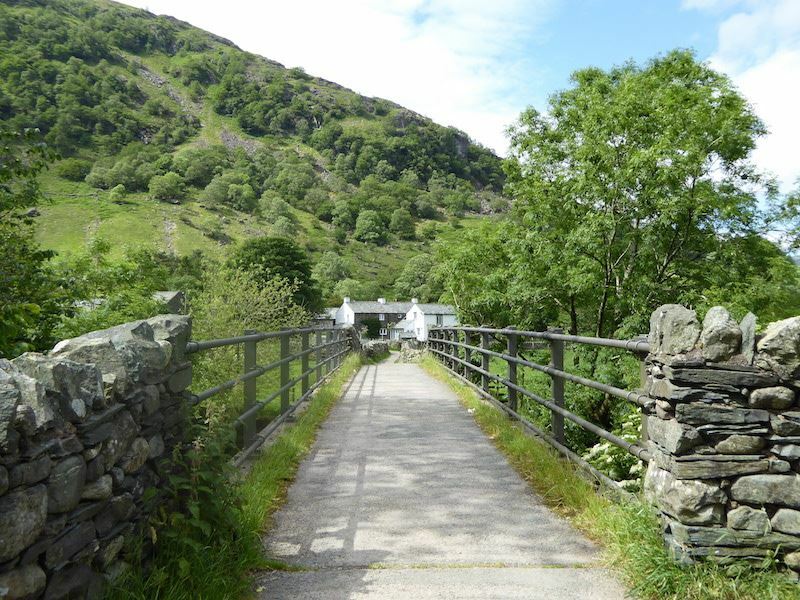 We cross New Bridge and make our way to the Flock Inn Cafe for a cup of tea. 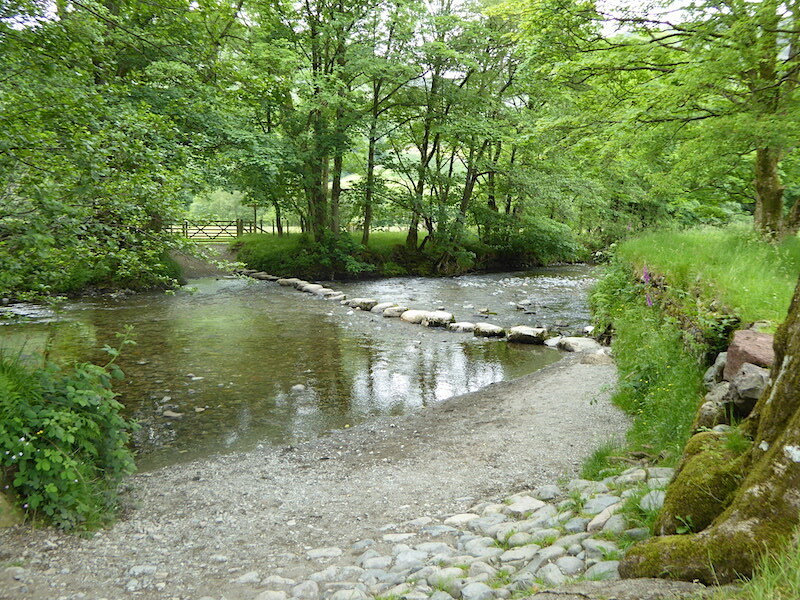 We could have crossed over using …..
….. the stepping stones further along the riverside path. 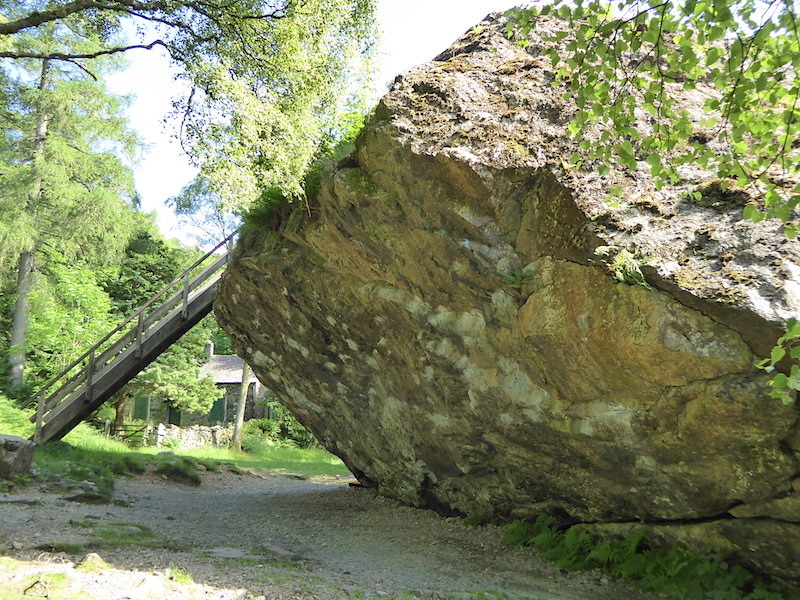 After a refreshing cup of tea in the garden at the Flock Inn at Rosthwaite, we go over and have a look at the Bowderstone before we drive back home. 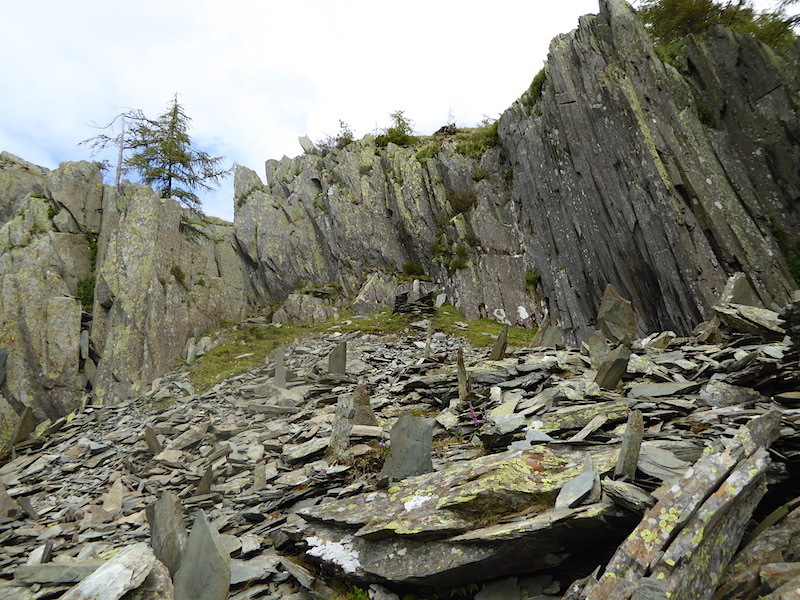 So many feet have stood on top of the Bowderstone that the rock has been polished like marble. 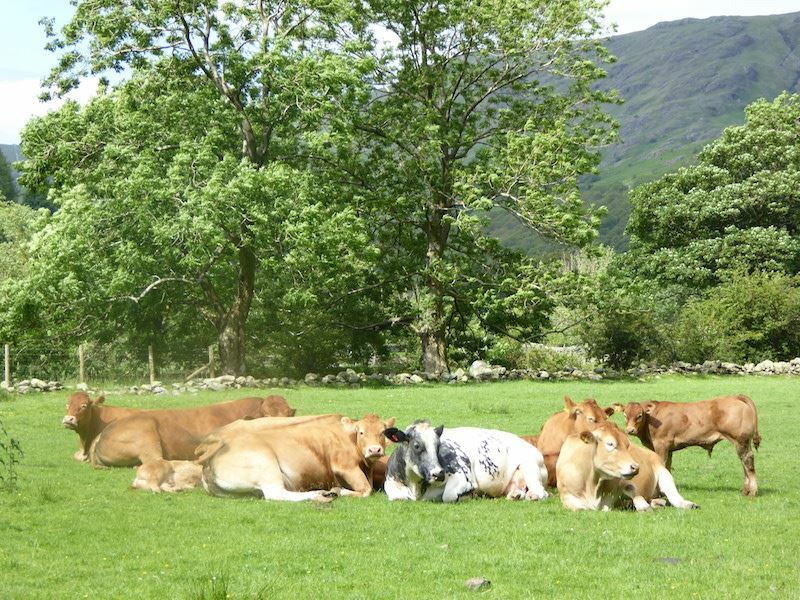 The overcast skies have cleared and very strong sunshine is back again now. 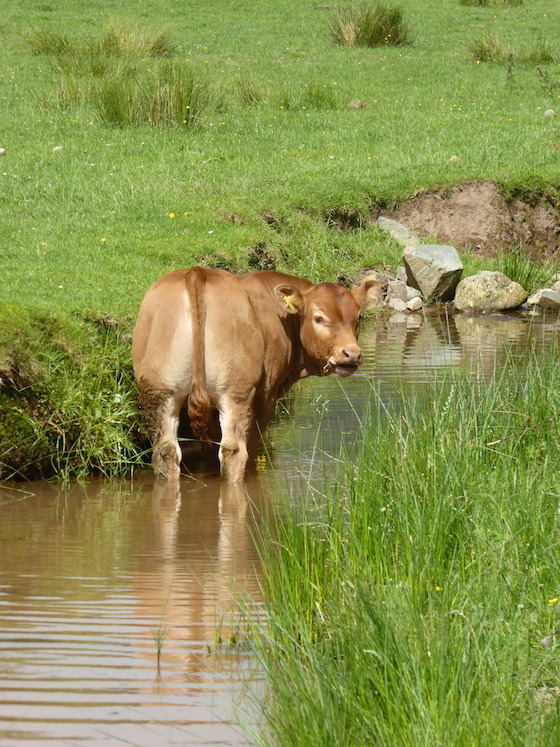 That often happens at the end of a walk and its is very, very annoying. 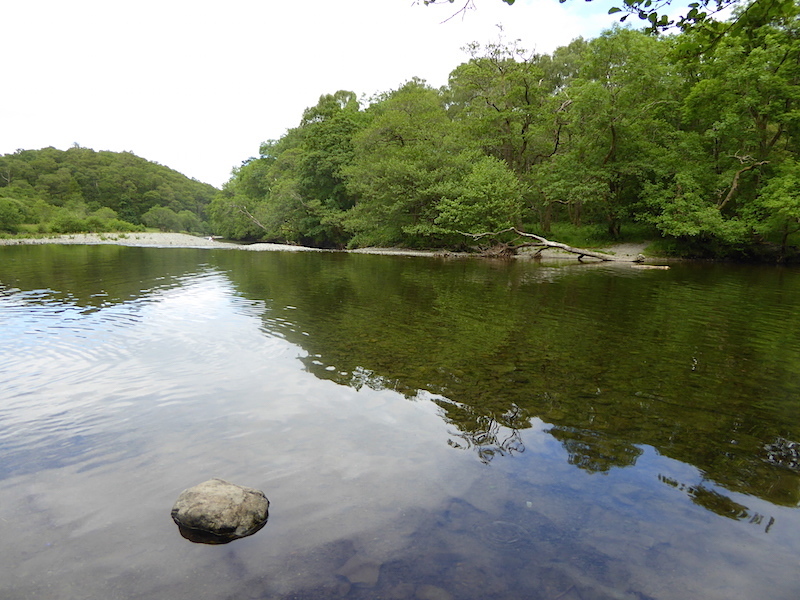 ….. and from the other side. 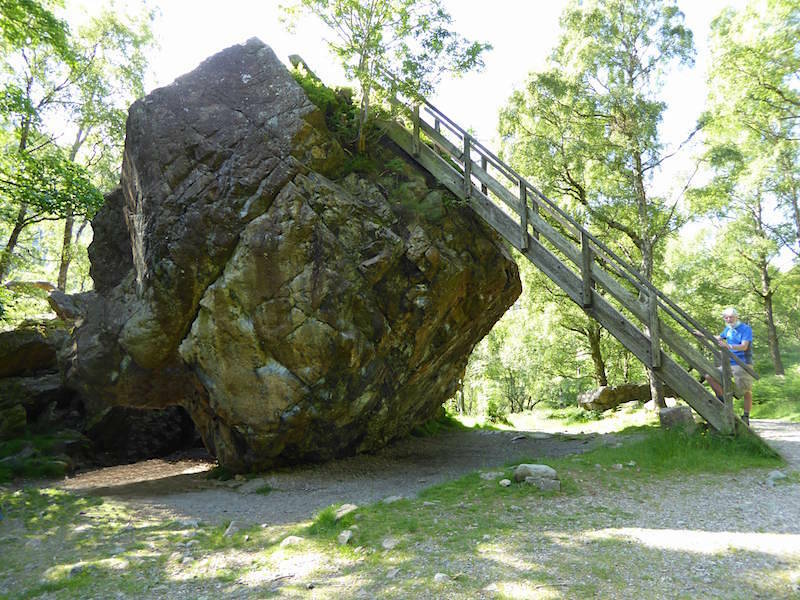 It might be a glacial erratic or the result of a rockfall from the hillside above. Its thought to weigh about 2000 tons and it stands about 30′ high. 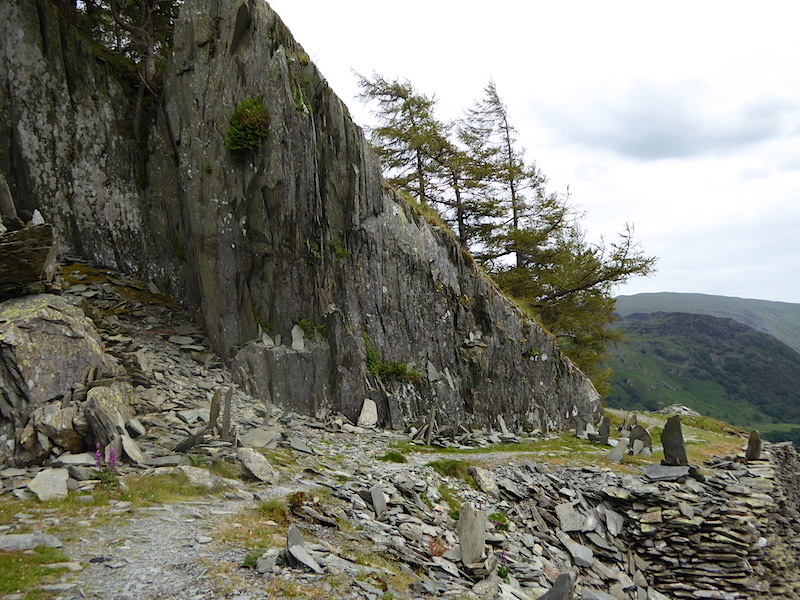 You sometimes see budding rock climbers practising their skills on it. 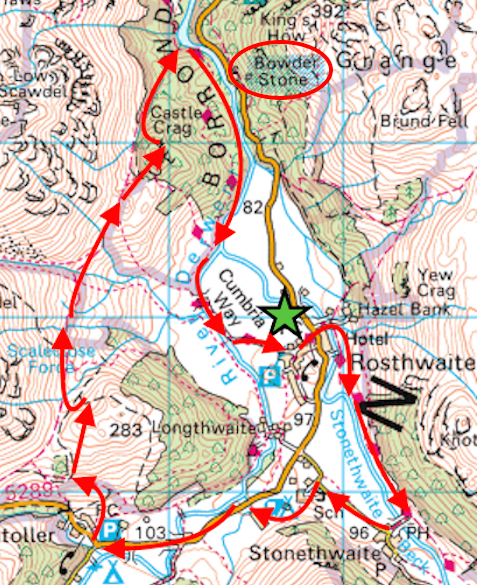 On the way back to the car we decided that it would be rather nice to round off our walk by stopping off at Keswick and treating ourselves to fish and chips from our favourite chippy. 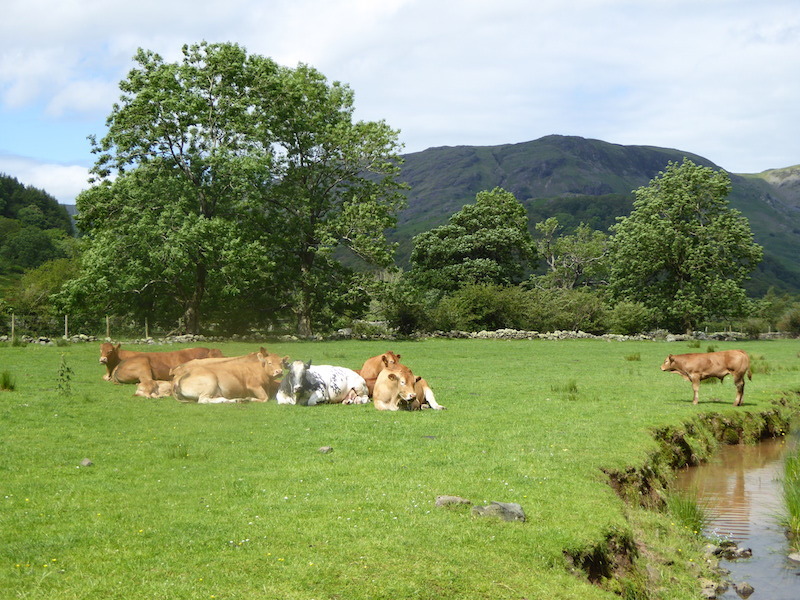 Very nice they were too, especially as we ate them sitting in the sunshine by the boat landings on Derwentwater and being entertained by all the hapless goings on in the rowing boats.